Book Review Signs of Your Identity. By Daniella Zalcman Reviewed by Forrest Soper Working under a grant from the Pulitzer Center on Crisis Reporting, Zalcman spoke to 45 individuals in the Saskatchewan province, who were placed in the Indian Residential Schooling System as children. Many of their stories are told in Signs of Your Identity. Photographs by Daniella Zalcman. Text by Marlene McNab. Cree Translation by Doreen Oakes. FotoEvidence, New York, USA, 2016. In English and Cree. 120 pp., 56 black-and-white illustrations, 8¼x8¼". For roughly 120 years Canada operated numerous institutions under the guise of the Indian Residential Schooling system. Thanks to the Indian Act of 1876, officials were legally allowed to take indigenous children into their custody and place them in predominantly Catholic boarding schools. Here children were subjected to horrific living conditions. Countless reports of physical and sexual abuse plagued these facilities. Disease was rampant, and due to poor living conditions and inadequate care, the resulting death toll was abhorrent. While there are no official records of how many children passed away, investigations concluded that the death toll reached at least 6,000. Signs of Your Identity. By Daniella Zalcman. FotoEvidence, 2016. All of this was supposedly done to ensure that indigenous children were properly educated and better prepared to enter the workforce. In reality, the institutions attempted to assimilate a new generation into “western culture” by abolishing aboriginal culture, traditions, and language. Children, sometimes as young as two or three years old were taken from their homes and placed in institutions where they would be punished for embracing their culture or speaking in their native language. This program was truly one of the darker chapters in Canadian history and was in practice for far too long. The last school closed in 1996, and the first official apology from the Canadian government was issued in 2008. Still, the effects of this now defunct program are present in the individuals who survived. 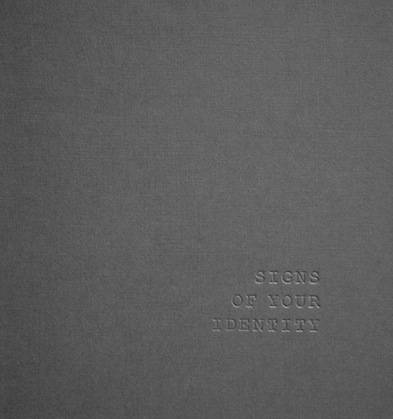 Daniella Zalcman tells the stories of these survivors in her first monograph, Signs of Your Identity. Working under a grant from the Pulitzer Center on Crisis Reporting, Zalcman spoke to 45 individuals in the Saskatchewan province, who were placed in the Indian Residential Schooling System as children. Many of their stories are told in Signs of Your Identity. This book has already received notable praise, being the recipient of the 2016 FotoEvidence Book Award, and being selected as one of the Best Books of 2016 by Sara Terry, and it is clear why. The book, with its unassuming gray cover, is remarkably powerful both in terms of content and design. Beginning with a brief history of the Indian Residential School System and an introduction by the mental health therapist Marlene McNab, this book quickly begins telling the stories of twenty-five individuals who were placed in these schools for various durations of time. For the majority of the book, Zalcman follows a simple but incredibly successful design formula. On the left, text displays the name of the individual pictured on the opposite page, as well as which school they were placed in, how long they were there, and a quote about their experience. On the right, a portrait of the individual is printed on translucent vellum. When the vellum page is turned, a double exposure is revealed beneath. This image is composed of both a portrait of the individual and a photograph taken where the residential school they attended once stood. The result is incredibly moving. When the vellum is displayed on the right you can just barely see evidence of the double exposure, an illusion that is three-dimensional and seems to breathe and change as it is lifted ever so slightly from the page beneath it. When the vellum is displayed on the left, you are able not only see the double exposure in its entirety, but you also must physically look through the straight portrait to see that individual's words. Often vellum is used in book design as an embellishment or a garnish, but rarely is it used to enhance the content of the work as well as it does in Signs of Your Identity. While the design aspects of this book are to be admired, they in no way detract from the importance and the gravity of the work. People tell us about being raped and abused as children, a woman mentions that she is now afraid of god and a man describes how, as a result of his experience, he struggles to love his own children. Their stories are haunting, and we know that we are only shown a small glimpse of the atrocities that occurred. Perhaps that is why this book is so powerful, not only because it talks about the horrible actions of the past, but because Zalcman was able to create something so beautiful and dignified despite them. This book is less about condemnation and more about resilience.